Randa Kattan, CEO of Arab Council Australia, warned such racist type of events could quickly spiral out of control. “In terms of numbers they might be insignificant, but in terms of damage, it is significant,” she told the Guardian. She called the protesters “squeaky wheels grabbing attention,” but was careful not to underestimate such groups for attracting interest to their cause. “It only takes one incident,” she warned. 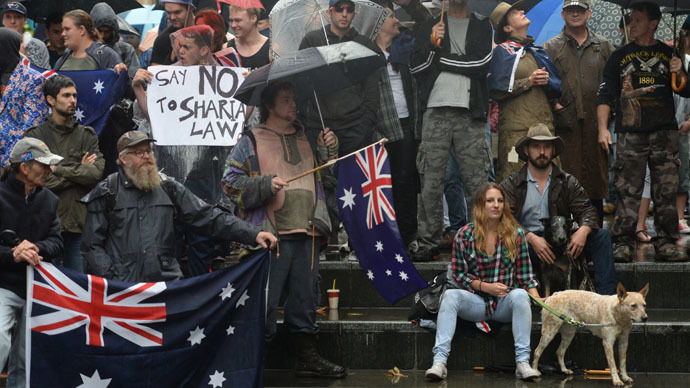 The ‘Reclaim Australia’ protests on Saturday were held in 16 cities and towns nationwide, attracting hundreds of demonstrators, who said they are against the imposition of Sharia law, and the wave of multiculturalism that has swept the country. However, the anti-Islam protesters met stiff opposition from the left-wing umbrella group ‘No Room for Racism.’ Tensions peaked in central Melbourne, where police struggled to keep anti-Islam and anti-racism protesters separated. Medical officials said four people were treated for minor injuries, while police spokeswoman Belinda Betty said two men and a woman were arrested following the violence. More than 100 police were deployed, with almost a dozen mounted police also helping to keep the situation under control. “People have the right to freedom of speech, but people need to be accountable to what they say and if people are spreading hate speech and lies, particularly about religious or ethnic minorities, then they need to be held accountable for that,” she said. Greg Fealy, at the School of International, Political & Strategic Studies at Australian National University, believes the anti-Muslim faction subscribes to an “Anglo-centric” worldview. “Although they claim it’s to protect an Australian way of life, their vision of that way of life is a very Anglo-centric one, and one that often quite specifically rejects the role of Muslims in Australia,” he told RT. Fealy then mentioned some comments by Prime Minister Tony Abbott that came at a bad time. Other activist also suggest the government of Prime Minister Tony Abbott is largely responsible for stirring up anti-Islamic tensions and making new arrivals to Australia feel unwelcomed. Kon Karapanagiotidis from the Asylum Seeker Resource Centre blamed the government’s tough border protection policies for the rise in attacks on minority groups. 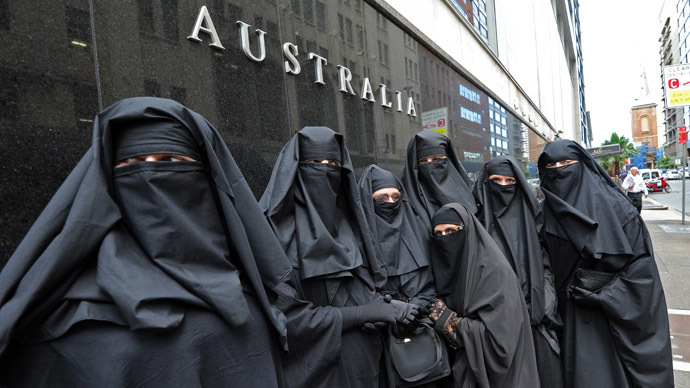 Tensions between Australians and Muslims have been mounting of late. In September, Australian police launched a series of anti-terrorism raids, while a siege by an Iranian-born Muslim man in Sydney last December left three people dead and four injured. A survey conducted by the University of Queensland at the start of 2015 reported that up to 75 percent of Muslims living in Australia say anti-terrorism laws target them unfairly.